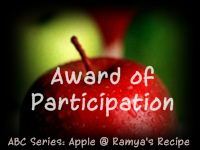 Received an 'Award Of Participation' award from Ramya of Ramyasrecipe for participating in ABC Series : A for Apple Event. Thanks a lot Ramya for this cute little award. First time here,glad to follow you.Please do drop at my space. chanced by your space while blog hopping..
nice space you have...interesting presentation..
i tried ur apple cake. its so tasty.